All of our authentic Orleans Method vinegars are available in our special "food service for the home chef" size. For those who want more product, want less packaging, all for a better value...here it is in our half-gallon size. AgroDolce in Italian means "sweet and sour." To achieve this with our Late Harvest Zinfandel Vinegar, we harvest 100% North Coast grapes from the Suisun Valley in October when the brix (sugars) are over 30… very concentrated and almost port-like. We then ferment the sweet grapes into wine before adding it to our oak barrels with the addition of some "mother" (the starter) for its slow journey to becoming vinegar. The garnet, port-like color gives way to a "jammy" texture with lots of plum and fresh berry overtones and a pleasant, crisp finish. 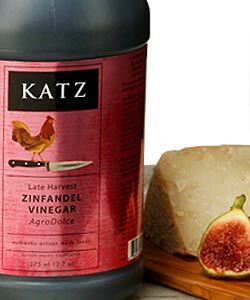 Works wonders with all things tomato, with fresh figs and pears, marinades and sauces for lamb and beef and salads with flavorful blue cheese.